Facebook’s COO Sheryl Sandberg is starting up a mentorship network for women in tech. The idea is to boost women studying and working in computer science by networking, supporting and learning from each other. It’s a well-documented problem that the tech industry is male-dominated – and the future’s not looking brighter. Barely one in five computer science students are women today, a percentage that’s dropped significantly since the 1980s. The solution to getting more women into CS is… getting more women into CS. This is because stereotypes are self-reinforcing; computer science and engineering classes “feel male” because they are dominated by men. To fix this, Sandberg’s Lean In project is starting a new global chapter - to promote women studying computer science and engineering. The project is supported by Facebook, LinkedIn, and the Anita Borg Institute. Looking for some extra support as you pursue your computer science and engineering career? Look no further—we’d love to have you as a part of a wide network of women who want to Circle up in support of women in CS&E majors at colleges around the world! In Lean In, Sandberg’s book published in 2013, she described her own experiences of gender differences in tech, offering practical advice for women in the field. Since then, Lean In Circles have broadened to become an on- and offline community supporting women in tech with monthly meetups. More than 21,500 Circles have formed in more than 97 countries. How can we encourage women to study computer science? It’s unlikely any of you would be surprised, sadly, to hear that only 17.6% of computer science undergraduates were women in 2011. What might surprise you, is that that number is less than half of what it was in 1983/4 – when 37.1% of undergrads were women. 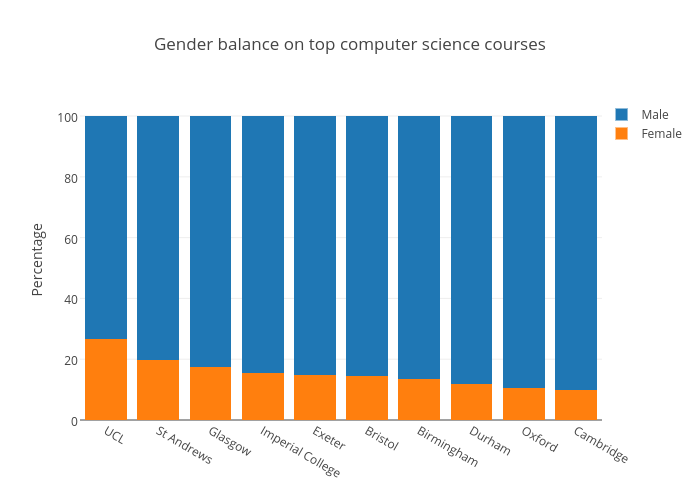 Computer science is the only field in mathematics, engineering and science where the percentage of women on the course has decreased since 2002. After leaving university, women made up 26% of the computing workforce in 2013, but still only earned 84cents for every dollar a man earned. 17% of Google’s technical employees are women, and at Facebook it’s a measly 15%. But these statistics are as unsurprising as they are unfortunate, as if only 18% of the people with the qualifications are women, that’s how many women are likely to get hired for the jobs that require that qualification. However, some universities are taking steps to tackle this trend. Universities in America are offering courses to train secondary school teachers to teach computer science to their students before, and have started using photos of women in their prospectuses.